An illuminated Sign is any sign that incorporates illumination from within the sign case structure. We use low voltage (12v) LED lighting. LED lighting is now preferred over other forms of lighting for the following reasons. Maximum running hours of illumination far exceed that of fluro or incandescent lighting. Maintenance costs are dramatically reduced because of longer running times. Low voltage (12v) LED systems allow the sign maker to wire and install without electrical permits that are required for higher voltage systems. LED lighting can be dimmed and sequenced to flash to customized programming. In addition to the above benefits is the Lowering of Greenhouse Gas Emissions due to the decrease in power required for lighting the sign. Pylon Signs – Single or Multi-pole structures, these signs are usually the main site identification sign highlighting the business location. Signs are generally double sided. Depending on surface area of each illuminated panel, faces are generally opal acrylic with translucent vinyl graphics or digital printed graphics applied to the face. In areas prone to vandalism, faces might be made from ‘bullet-proof’ polycarbonate sheet or flex face covering. Main structure is usually steel with zinc anneal or aluminium sheet fabricated lighting cabinets. There is a growing trend in the use of aluminium composite panel for cabinet work. Pylon signs have structures below ground for support. Poles are either directly concreted into the ground or have base plates that locate over a ‘cage of bolts’. The cage of bolts is a pre-fabricated and engineered structure that is set in concrete in the ground prior to the main pylon being bolted on top. Single Sided Fascia Signs – Generally speaking these are signs attached to the fascia or wall of a building, positioned below the roofline of the building. 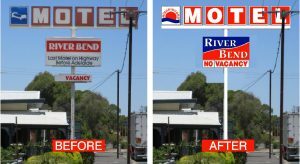 The sign face is generally the same as for pylon signs ie decorated with translucent vinyl or digital print on acrylic, poly carbonate or flex face sign face material. The cabinet structure is generally zinc anneal, aluminium or aluminium composite panel. Where zinc anneal or aluminium is used, the outer casing and flanges are usually coloured using either a powder coat or ‘two pack’ paint finish. Fixing of the cabinet to the wall is via can be via an assortment of fixings dependent in the wall type and engineer requirements. Fixings method might include, masonry anchors, concrete screws, chemical anchor, ‘loxins or dynabolts’, lead or nylon wall plugs. Garden Bed Signs are best described as a smaller version of a pylon sign. – smaller in height, sign area and somewhat lighter in construction. Manufacture, panel construction and installation process are much the same as ‘pylon’ signs also. Under Awning Signs – These signs are as what they suggest, signs under the awning. The two main components are the ‘light box cabinet’, generally double sided and the ‘bracket / fixing’ of the light box to or through the awning structure. The cabinet structure is generally zinc anneal, aluminium or aluminium composite panel. Where zinc anneal or aluminium is used, the outer casing and flanges are usually coloured using either a powder coat or ‘two pack’ paint finish. Sign faces and decorations are the same as employed in pylon signs though the sign would not allow for flax face as a panel option. Bracketing is customized to suit the box location and awning structure. Cantilever Signs – These are identical to most under-awning signs but in this instance is fixed to the wall of the building – under an awning or exposed without awning. Could be above awning but generally not seen above the roof line of the building. The cabinet structure is generally zinc anneal, aluminium or aluminium composite panel. Where zinc anneal or aluminium is used, the outer casing and flanges are usually coloured using either a powder coat or ‘two pack’ paint finish. Due to the leverage generated by the cantilever weight of the sign, these generally have steel structure and heavy duty mounting plates for bolt fix to wall. Generally sections of threaded rod are fixed into the wall using chemical anchor. The base plate and associated sign box structure is then bolted fixed to these protruding threaded rod sections. Size, number and location of threaded rod are generally determined by the certifying engineer. These signs are generally fabricated from acrylic and internally illuminated using neon or more recently, using 12v LED lighting modules. Other sheet materials and fabricating processes can be deployed depending on the designer requirements and application. The way the lettering uses illumination can also vary. Lettering faces and sides might be decorated with translucent coloured film, printed film or actual translucent acrylic. Lighting can be fixed to the letter backing that is fixed direct or spaced of the backing / wall or on the back of the letter face in application of halo and / or side illumination. Halo illumination – light through letter sides and or back of lettering spaced off wall Side of letter illumination – lighting through letter sides only. Face illumination – lighting through face of lettering only. Combination – of any or all of the above! 3D lettering might also incorporate other materials such as extruded gold or silver / chrome finished letter edge materials. In this instance the letter face only is illuminated. Custom made aluminium extruded ‘flat pack’ light box – with LED Lighting. Specify your mounting need – wall mount, pylon, cantilever or hanging support fixed. These signs usually have large area illuminated faces that can be complex in shape and used as an alternative to acrylic where sheet size restrictions would see acrylic panels with joins used – highly undesirable given the expansion and contraction issues of acrylic that may well render panels unsafe in high winds. Flex Face is a term used for a flexible substrate usually a translucent reinforced vinyl fabric that is decorated using solvent digitally printed inks or translucent vinyl cut graphics. The decorated fabric is stretched over the fabricated letter and tensioned using any number of custom or proprietary extrusions. Edging is than capped for a neat finish. Internal structure id either steel tube or aluminium extruded section with cladding in zinc anneal or aluminium with powder coat or two pack paint finish. Flex Face faces are also preferred for their resistance to objects being thrown at the sign. Pan Channel Letter Signs – are used in the production of illuminated signs. Typically, pan channel letters are used for outdoor sign applications, but they can be used indoor as well. Until recently, neon has been the only option for illumination. LED lighting is becoming the preferred option especially as LED lighting offers colour change, economical running and maintenance costs. Pan Channels are the most common type of sign letter. They consist of a metal “pan” that is shaped like a letter. This “pan” houses the electrical and lighting components of the letter and can mount directly to a building’s fascia. A plastic face is then attached to the letter pan using trim cap material. The face is typically decorated with translucent or digital printed vinyl enabling the sign to be seen at great distances during the day and light up at night. In just about every application, type and installation, approvals must be sought from the relevant authorities. Development Applications (DA) are required from local councils. Depending on the location, type and size of sign, other statutory bodies might also need to provide approvals. A list of Council Regulations and other requirements are posted here for your interest.